I had the chance to attend one of those once-in-a-lifetime VIP-only events on July 10th, 2017 at Intercontinental Hong Kong with Alain Ducasse and Dom Perignon’s Chef de Cave Richard Geoffroy, for the introduction of new vintage Champage P2 2000, also called “Plenitude Deuxieme”. And guess what, I had an exclusive talk with them! 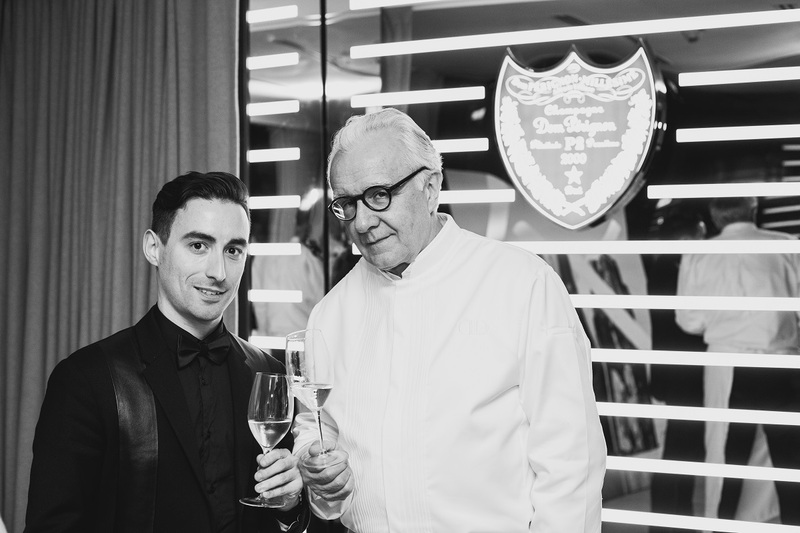 When you are invited to a unique event organized by the French haute-cuisine’s legend Alain Ducasse and Dom Perignon’s Chef de Cave Richard Geoffroy, you just can’t refuse. They offered guests an incredible tasting experience throughout an 8-course dinner menu highlighting all facets of the brand’s new vintage Champagne P2 2000. One night only. Before that, I had the great privilege to meet M. Ducasse and M. Geoffroy for an exclusive interview session in the privacy of a hotel’s suite around a glass of Champagne. We spoke about their collaboration for this event, about Dom Perignon and of course – you know me – about a few anecdotal things. Francois Le Hecho: How started your collaboration and how did you prepare this event? A magical moment with a very high attention to detail. Alain Ducasse: Actually we know each other for more than twenty-five years and are regularly working together, for instance last year we built a unique experience at Chateau de Versailles with the purpose of revisiting the classicism of French cuisine. Today our collaboration around Second ‘Plenitude’ of Dom Perignon 2000 vintage is both visible and invisible, building a magical moment with a very high attention to detail. Simply magnify the Champagne. Richard Geoffroy: Absolutely. I would say we prepared tonight’s event as two voices responding one to another: it starts from the wine and food allows to sublimate its taste, creating a kind of fleeting moments for guests. 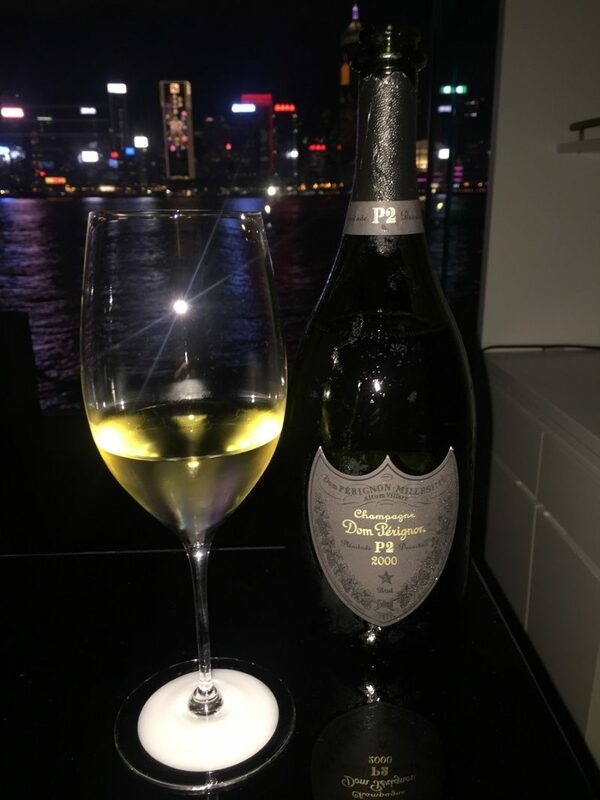 FLH: I am curious about Dom Perignon P2 2000, could you describe it to the neophyte I am? What makes it so unique? The quintessence of patience which produces something exceptional. RG: I like neophytes. Virginity to taste is very interesting and can help to appreciate such Champagne, as long as you have a sensitivity to aesthetics. […] This vintage is a proposal for senses. It’s pretty mysterious, an equation of Champagne and religious offering several layers of exploration. To make it simple, P2 is the result of my selection of the best grape varieties, assembled with 16 years of maturation in cellars. The quintessence of patience which produces something exceptional. AD: This Champagne can adapt to any sort of dish, it enables approaching and integrating new senses even for neophytes. And to me, it has to be tasted lonely. Just you and the wine. That’s the best way, neophyte or not, to appreciate it. FLH: M. Geoffroy, as Dom Perignon’s Chef de Cave you are really at the heart of this prestigious house. Could you explain what’s the legacy of the Benedictine monk who gave his name to the brand? RG: Obviously, nothing technical. It’s all about a vision of aesthetic, an intensity and a kind of God spirit. The sum of harmonies used to create our Champagne goes far beyond the individual elements. It’s also lightness of being. In other words, it’s Plenitude. FLH: We like to speak about luxury travels on The Luxe Insider, and I guess you are both very frequent world travelers. Can you tell us one of your most impressive journey? AD [laughing]: I have so many to tell! I remember my collaboration with Air France’s Concorde, back in 2000, for which I designed onboard menus. I had an agreement with the company to fly in the cockpit, with pilots, for my Paris-NYC trips. At the end of a journey, just before landing, we had the chance to admire another Concorde take-off in a magnificent clear sky. It really was an outstanding picture. RG: I have also an anecdote from the 2000s, when I went to a Zen temple in Kyoto. I assisted to the preparation of a vegetarian shojin ryori meal by a Zen master and I have been amazingly impressed by the spiritual and out-of-the-world atmosphere. In the early evening the 30 guests were invited to start the journey at Rech by Alain Ducasse restaurant with a solo tasting in a dark room. As M. Ducasse told me, ‘just you and the wine’. And I the setup was really amazing: each guest was standing up in front of a pillar, with a lighted glass and a bottle of P2 2000 Champagne, admiring Hong Kong skyline through the floor-to-ceiling windows. A very personal and intense instant sublimated with music. Then we all went to dining room where three round tables were waiting for us. Here again the setup was specifically created for this event, with white marble and avant-garde design mirrors reflecting Hong Kong Victoria Harbour view for all attendees. And the experience continued throughout the four starters, three main courses and the dessert, each of them enabling to sense a new detail of P2 2000. I have been particularly “moved” by the turbot and its gold caviar, which was for me the pinnacle of the vintage Dom Perignon and Alain Ducasse marriage. After dinner, we enjoyed a moment with the Chef and M. Geoffroy in a third and final room, where both received applause and deserved congratulations. And in the sound of late night discussions, this trip in haute-cuisine & vintage Champagne world slowly ended, leaving in all guests’ mind the souvenir of an enchanted journey. Considered to be one of the most renowned chefs of his generation, Alain Ducasse is at the helm of three restaurants each awarded three Michelin stars in Monaco (Le Louis XV-Alain Ducasse à l’Hôtel de Paris), Paris (Alain Ducasse au Plaza Athénée) and London (Alain Ducasse at The Dorchester). M. Ducasse, who hails from the Landes region in the Southwest of France, is known for his innovation, attention to detail and dedication to both quality and technique. His desire to pass on this knowledge lies at the heart of all his projects. Richard Geoffroy is the Dom Perignon’s Chef de Cave since 1990. He offers unique ways to experience the wine based on new gustatory cultural and sensorial correspondences. From his travels, he captures and filters a myriad of impressions, which he reinterprets in the making of Dom Pérignon. In 2000 M. Geoffroy decided to give the Dom Perignon’s lovers an access to a few rare vintages from the concept of Plénitudes. In the Plénitudes, the wine continues to mature for years and even decades, and is reborn several times. This is the Dom Perignon Plénitudes project, the ultimate expression of a wine whose style defies time. P2 2000 is actually the Second “Plénitude’ of this Dom Perignon’s vintage, marked by extra energy, intensity, vitality and depth. 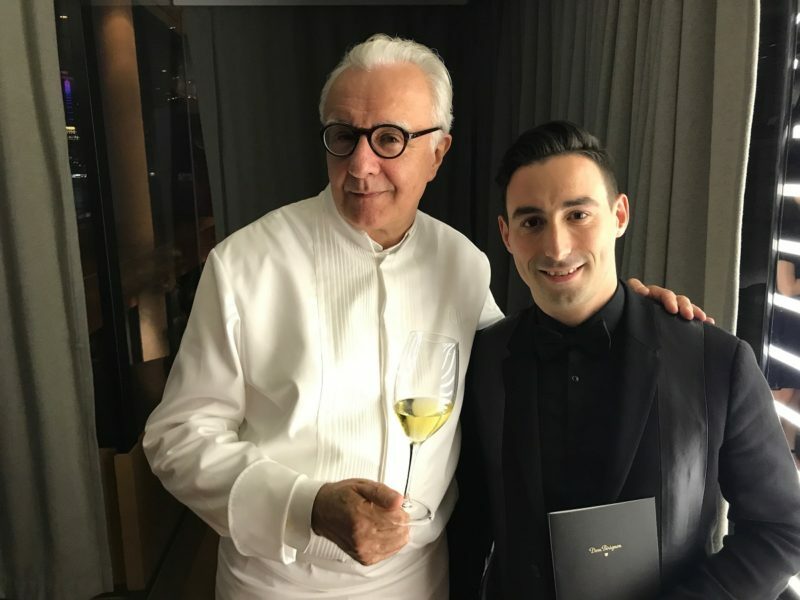 The interview has been realized with M. Alain Ducasse and M. Richard Geoffroy on July 10th, 2017 at Intercontinental Hong Kong – Transcription of a French/English discussion.